As Decadent and Gorgeous as her Gypsy namesake, Yacht Zingara offers unparalleled spaciousness & comfort. Yacht Zingara's luxurious salon, 5 en-suite staterooms and superior service yield a yachting experience unmatched throughout the Caribbean. Exclusively yours from bow to stern. Contact us today to plan your custom Caribbean itinerary. electronically operated venturi type discharge toilets and vanity cupboards. 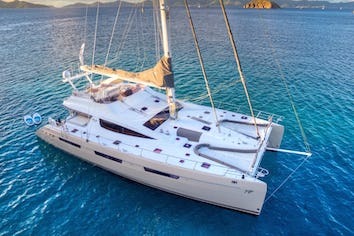 WiFi available in the BVI - For charters outside the BVI, WiFi can be arranged, at an additional fee. Up to 10 dives during the week and dive gear are included. Resort courses are included. 2 Dive Instructors aboard. is an active and enthusiastic person, he enjoys all water sports. The experiences he has gained through his travels along with a jovial personality creates a pleasant atmosphere which is enough to make any guest aboard feel right at home, ready to relax and enjoy themselves. From working as an instructor and guide onboard a yacht in the Bahamas, a five star resort in Cyprus and various other islands within Europe and the Caribbean she is never found too far from the ocean! She loves all water sports and is particularly fond of swimming, with the aim of swimming across the English Channel in the next five years. Our family of seven sailed on Zingara from June 7-17, 2018. It was almost impossible for us to even put our trip into words for this review because it was such an incredible, once-in-a-lifetime experience. Zingara is an incredible boat with every amenity you could want—complete with chocolates on the pillows every night and spacious, impeccably-maintained guest suites. The boat is fully equipped for almost any type of fun imaginable. Pool noodles, inner tubes, a party float, waterskis, a complete set of SCUBA and snorkeling gear, and a crazy fun tubing tube are just some of the water activities available. The nets on the front of the boat are a great place to relax with a book or just lay out in the Caribbean sun, but there are also some great shaded areas in the aft cockpit and the bridge if you prefer to stay shaded. The SCUBA certification course was expertly executed and all of the dives were memorable and full of exciting marine life. We had a mix of uncertified and certified divers at the start of the trip, but even those of us who were certified did not consider ourselves particularly SCUBA-savvy. By the end we all felt comfortable and excited by all the underwater adventures SCUBA diving offers! Camille and Andres are truly exceptional instructors beyond compare. Every day held a new and exciting adventure in the BVIs, complete with incredible excursions ashore. We loved exploring the Baths at Virgin Gorda, hiking to the bubbly pool, scootering around Anegada, and playing beach volleyball at the Soggy Dollar. The BVIs have the opportunity to create endless memories; it is almost impossible to pack it all into 10 days there—we will just have to come back! Beyond the island adventures, every single meal was an artistic and culinary masterpiece that never failed to delight us and perfectly complement the activities of the day. We are still dreaming of Tyler’s cooking! Part of the excitement of a new day in the BVIs was a whole new menu of culinary surprises from Tyler’s kitchen. We were initially worried about our group’s many food intolerances, preferences, and allergies, but Tyler adapted the meals with expert ease. Above all, the crew is what makes Zingara so incredibly special. Lee is an incredible captain who navigates the Caribbean waters with a relaxed confidence. He was also happy to entertain all of our questions about sailing and life on the water! He is funny, wonderful to converse with, and even included us on a fun provision run ashore! Not really stuffy at all!!  Camille is so kind, helpful, and awesome to adventure with. She keeps the cabin looking incredible, makes amazing lemonade and cookies, and is also an awesome yoga instructor! She makes sure every guest is comfortable and happy throughout the day and is an excellent underwater guide—she finds amazing wildlife that you might miss otherwise! Andres is another essential part of the Zingara experience. He instructed two new divers through their SCUBA certifications with ease. He helped us catch a Jack fish and Tarpon off the stern, and was always excited to help us fish and adventure on the water! He was a great captain of the tender boat and even helped a first-time tuber feel safe enough to try it out. He is also an expert crafter of cocktails and the beverages of your dreams—be sure to try the Painkillers! His fun-loving attitude keeps spirits high throughout the trip. Tyler is an incredible chef worthy of a Michelin star or two, but he is also an excellent conversationalist with great stories and jokes. We loved chatting with him and learning all about the inspiration for his incredible culinary creations. They are all fantastic crew-members, but, more importantly, they are all truly incredible people. By the end of the trip, we counted every one of them among our friends! Zingara is a magical place where dreams come true! They entitled their letter "Zingara Magic"! The week with you on the Zingara was our BEST family vacation EVER!!!!! The catamaran was very beautiful, and the vacation was totally spectacular. Tyler, you prepared such delicious meals which were elegantly presented, and Camille, you created a uniquely beautiful table setting for each meal. We appreciated so much that we all interacted so comfortably and really enjoyed laughing and talking together throughout the week. Camille and Andres, you were such energetic and enthusiastic “leaders” for our teenage grandchildren! Because of you, they will always cherish special memories of fishing, kayaking, scuba diving, snorkeling, sailing, paddle boarding, and best of all, jumping from the halyard swing. And Lee....we know you are the BEST captain in the Caribbean!!!!! We all will remember you fondly and will always be grateful for your constant effort to create a magical vacation for our family. Thank you so much!!!!!! Thank you for making our return to the beautiful BVI’s as special as before. It’s been 17 years since we last visited and post hurricane it is back in great shape. The bars, beaches, restaurants, quiet bays to anchor overnight etc are all wonderful, even The Baths were not crowded.....bliss! You all made us feel so looked after, nothing was too much trouble, so helpful, creative, fun and friendly.....it felt like having friends on the boat with us! Calm Camille was brilliant with my 12 year old and his first diving experience, All Action Andres kept my 14 year old adrenaline fuelled up ( ... and us with the best ever mojitos! ), Tyler with a Twist kept us well fed on glorious food and new tastes (the scales back home show that!) and oh so Likeable Lee......thank you for putting it all together in a beautiful Zingara package. Here’s hoping for the Grenadines one day very soon!! Just back from a week in the British Virgin Islands on Zingara. The boat was beautiful and the crew friendly and accommodating. Best of all the islands are back in business and the water and beaches as beautiful as ever, with the added bonus of being less crowded than usual. We were all talking over dinner tonight in the Miami airport about what an amazing time we had with you , Andres, Camille and Tyler this past week. Frankly , we were expecting the BVI's to be a bit war torn after the hurricanes , but were pleasantly surprised to see things nearly back to normal. The st Thomas airport was in fine shape and the islands in the BVI 's as beautiful as we remembered. Dinner on Anagada was great, the Soggy Dollar bar was a lot of fun and scuba diving in several very cool spots was a definite highlight. Zingara is a beautiful boat. Extremely comfy and your crew very attentive . We all loved Tyler's cooking and the cocktails were tasty and plentiful. My family was pleased to see the BVI's as beautiful as ever and we appreciate you creating a wonderful week for us !! The staff on the Zingara was amazing from the time we stepped onto the boat to the time we left. Our group needed some extra help with travel arrangements and the crew didn't hesitate to accommodate our needs. (Some people couldn't get into port on time for departure so they rerouted and picked us up on another island!) It made us feel at ease knowing the crew would help and arrange our various arrivals. Daily we woke up to smiles and unprecedented service. The meals were OUTSTANDING and touched on every guest's dietary needs and wants. The crew was jovial yet very professional making us feel at home and comfortable! I wouldn't ask for another crew! Thanks again for a trip of a lifetime! Many kudos again to Chef Tyler for saving the evening on the last night! The ten days on Zingara could not have been better. One complaint, your chef and crew, they caused me to gain 10 pounds. How is that possible in ten days. George also gained a lot. I guess the food must have been crazy good and the drinks just kept on coming. All your staff was great, constantly offering more drinks and looking for ways to please us at every turn. I have had a couple of captains before, on my 60' sport fisher, and by far you were the most professional and concerned for both the safety of the boat and the passengers. It showed in your anchoring, tying up to Secret Oasis, or avoiding a rainstorm on the way to our next anchor spot. Thanks again for an unforgettable time. 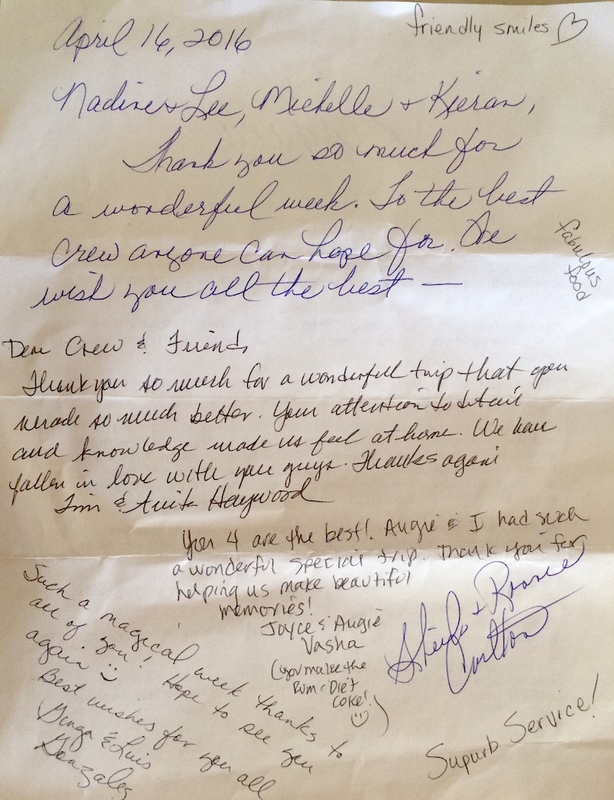 I just wanted to give a HUGE THANK YOU to you and your staff for the trip of a lifetime this past June on the Zingara! It was simply the best family trip we have ever been on! This was my first time on a BVI trip and I was simply blown away. First off, the Zingara and its accommodations are simply First Class - but then you and your crew take the experience to another level and truly make the trip a once in a lifetime event! Chefs Leanne's talent for creating amazing food to satisfy all kinds of tastes and preferences is unparalleled – not to mention her infectious laugh and outgoing personality made her an absolute joy to be with! The crew were simply endless in their pursuit of accommodating each and every one of us and making sure all were taken care of – all of the time - no matter the situation or activity! Their attention to the smallest of details was outstanding! Not to mention they are just fantastic people and a pure joy the be with and around – especially in hanging out with us [err, putting up with us] late into the night only to get up early to do it all over again! And thanks to you for your experience and professionalism – first off in dealing with the slight change of pick up port plans we needed to make due to flight delays and cancellations - and then for taking us to the most beautiful spots in and around the BVI and taking care of us in general all week. You are great captain and it was a real pleasure being with you and getting to know you! This was a trip we will always remember – in large part because it felt like we had lifelong great friends acting as our captain and crew! Thanks again for a fantastic week and we all look forward to joining you again one day soon! Cheers! We want to thank you for a wonderful trip this June on the Zingara. It was the perfect family trip for our large group. From the beautiful accommodations to the fun and professional crew to the unbelievable food. It could not have been nicer! You took us to the most beautiful stops. It will be something that we will always remember. We all look forward to our next trip with you one day soon! We are still ‘floating’ from this most amazing adventure in the BVI’s. There were so many highlights from our trip - the different islands we sailed to each day, taking advantage of all the activities the Zingara had on board - snorkeling, paddleboarding, scuba, tubing to name a few! But what made this trip really special was the level of service we all encountered, which enabled each of our families to spend the relaxing, quality time we all very much needed! The food was amazing and so was the boat itself. Thank you for being so accommodating and fun to be around. We all really enjoyed ourselves and cannot wait to go back to the islands! Hope everyone had a great vacation off the boat and enjoy all of the tours for summer. Take care! 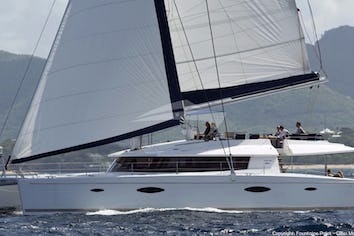 We are experienced yacht charterers, as we have been many boats with many different crew. First of all, the boat. Zingara is a perfect layout for 8 or 10 people (we had 10). There is plenty of space and different areas on the boat to spread out. Not only that, but she is provisioned well with many toys and activities. The SCUBA equipment in particular is new and very nice, which is important. The new owners have put money into the boat and it clearly makes a difference. Nice linens and towels, in addition to “the little things” that make a boat nice are all on board. 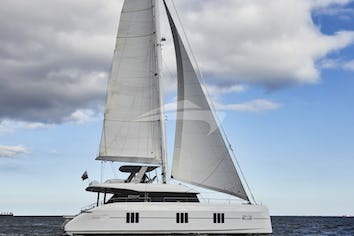 Of all the boats we have chartered, Zingara offers the most for the best value. Now, on to the important part of any charter, the crew. I can say unequivocally that this is the best crew, across the board, and that each one of the four individuals on board with us were the best at what they did of any crew we have ever had. Let me start with the chef, Teej. We had very different tastes in our group, from kids who only wanted kid food, to adults who will settle for nothing less than the best fine dining. We also had a few picky eaters and a shellfish allergy. At the end of the trip, EVERYONE of the 10 of us said that EVERYTHING they ate from Teej was the best food they have ever had, not just on a boat, but anywhere! Teej was so good that all of us are fighting over having him come to our homes when the charter season is over to cook for us personally. The meals were all creative with great flavors, and perfectly proportioned (except for the monster cookies). Teej never said no; if one of the kids wanted a PB sandwich, it would appear. Everything, from breakfast to lunch to appetizers to the amazing dinners and deserts, were Michelin star quality. Next, Kieran. The hardest thing to do in a confined space for a week is to keep the kids (ages 7-14) entertained and interested. Kieran did that wonderfully. At every stop all of the toys were instantly in the water and Kieran was ready to go with whatever they wanted to do. And he never got tired, if they wanted to be on the dingy for 4 hours, Kieran was there with energy and a smile. The new things he introduced us to were great, including the HaliJump, the SubWing, and the secret cliff jumping pool, all highlights. And I haven’t even talked about SCUBA yet, Kieran was awesome with the SCUBA, encouraging dives every day. By the end of the trip, he had certified two new divers, gave resort lessons to two more, and did multiple dives with the three pre certified divers. From beach dives to more advanced, everyone LOVED the diving. I can not say enough about Kieran’s great spirit, temperament, and energy. Finally, Captain Lee. From the time we got on the boat, everything was about us, and what we wanted. There was never a no said the entire time we were there. Not only that, but any side comment was heard, and acted on. So when one of us wanted something to eat that wasn’t on board, Lee snuck away and that afternoon it was on board. He truly listened and cared about us and what we wanted. He put together a great trip and at each stop showed us new and interesting things (remember, we have been to the BVI many times). Lee is so pleasant to be around and was really vested in making sure that each one of us was having a great time. It was clear that Lee was passionate about us, and passionate about Zingara. That passion was infectious and really made each of us have the trip of a lifetime. The personality of the crew makes a charter, and when 14 people are together for 7 days on 80’ of boat, it is the personality of the entire crew that makes the trip work, or not work. Not only did this crew make the trip work, but they made it the best trip we have ever taken, both for each individual, and as a family. I would highly recommend this crew to anyone looking for a wonderful week in the Caribbean. The best way to describe how GREAT our trip was this past holiday is "Nobody wanted to get off the boat". I think if the next week wasn't booked, we would of all stayed on.I don't think they make a better captain anywhere in the world. The crew was wonderful and was on top of everything. I told Michelle one day that we truly appreciated how they knew when to be around, but also not be right on top of us all the time. We didn't appreciate the 2-3 pounds we came back with to Texas from TJ's delicious food!!! The water sports were wonderful on the boat. My great niece and nephew up to myself had so much fun. Looking forward to our next adventure together. Jamie, Bert, Brett, Zachary, Natalie, Jenn, Cary, Eli and Sophie. 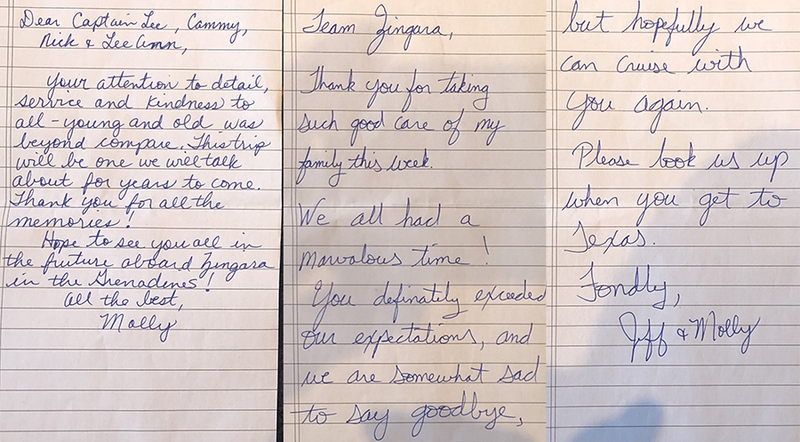 Guests with catamaran ZINGARA this past week said:What a fantastic week in a fantastic location, spent with fantastic friends, and a FANTASTIC crew. The crew made this trip absolutely wonderful from start to finish! They were always there for anything and everything!! Phenomenal food, drinks, and snorkeling sites every day. Our sincere thanks to Captain Lee, his lovely bride of one year, Nadine, Kieran and Michelle! !Great job by all!! We are back in Naples and missing the Zingara and crew. I am doing laundry and yes I must cook dinner tonight! Such a shock to my system after being pampered for a week! Mark and I had the best time last week! You all treated us as royalty! Your attentiveness and professionalism was accomplished in such a warm and friendly manner. Thank you to each of you! And thank YOU for the 5 extra pounds! Haha! The food was amazing! You are such a talented chef! Our crew has anointed me the "author" of the Zingara 2016 Cruise Cookbook! So if you would not mind sharing some of your amazing recipes, it would be greatly appreciated! Of course whenever it is convenient for you! Thank you for a perfect week and for the recipes! EVERYTHING WAS WONDERFUL and we would love all of the recipes, but have chosen these so as to not totally overwhelm you and your kindness! Watersports toys galore off the stern.